C-libraries can be imported to newLISP. Some of the libraries mentioned on this page are supported by newLISP module files. Note, that the MS Windows version of newLISP uses standard call stdcall conventions to call DLL library routines by default. This is necessary to call DLLs belonging to the Windows operating system like odbc32.dll. Most third party DLL's are compiled for 'C' declaration cdecl conventions. newLISP can use both calling conventions. 64-bit versions of Windows also come with 32-bit libraries suitable for 32-bit newLISP. newLISP compiled for LINUX and other UNIX uses the cdecl conventions by default for calling functions in shared libraries. Most UNIX libraries are available in 32-bit and 64-bit. MySQL is a very popular fast Open Source database engine used for web applications. A correct version of libmysqlclient.so is also necessary which should be available on your MySQL installation on macOS , Linux and BSDs. A mysql.lsp interface file is in the standard modules section. The PostgreSQL library is supported by one of newLISP's standard modules. Like MySQL the PostgerSQL database is a popular OpenSource database. SQLite is small SQL database engine, which can be compiled to a Windows DLL or LINUX/UNIX shared library. An access module interfacing with the library and a small console client to do maintenance on databases is available in the newLISP standard modules section. The GNU MP Bignum Library is a free library for arbitrary precision arithmetic, operating on signed integers, rational numbers, and floating point numbers. The newLISP source distribution has gmp.lsp a standard module to interface with this library. Since newLISP version 10.5.0, arbitrary precision arithmetic is built in to newLISP natively and gmp.lsp is mostly obsolete. The GNU Scientific library has about 1000 functions from different areas of math and statistics. The GSL module implements a few of them and is part of the standard modules distributed with newLISP. OpenSSL has several libraries for encryption. newLISP has a standard module for libcrypto. libz comes standard on macOS, Linux and other UNIX installations. The library has functions for in-memory and file compression and decompression. newLISP comes with zlib.lsp a standard module which imports these functions. libpcap is installed on most UNIX platforms for a MS Windows version go to http://www.winpcap.org. Ths libray is used to captute packets for network security related tasks see this example of a network sniffer. The GTK-server enables access for scripts to Graphical User Interfaces (GTK widget set). The GTK-server is a standalone binary, which is able to communicate using std I/O or TCP or UDP ports. The site contains also displays several newLISP examples. OpenGL has become the industry's most widely used and supported 2D and 3D graphics application programming interface (API). 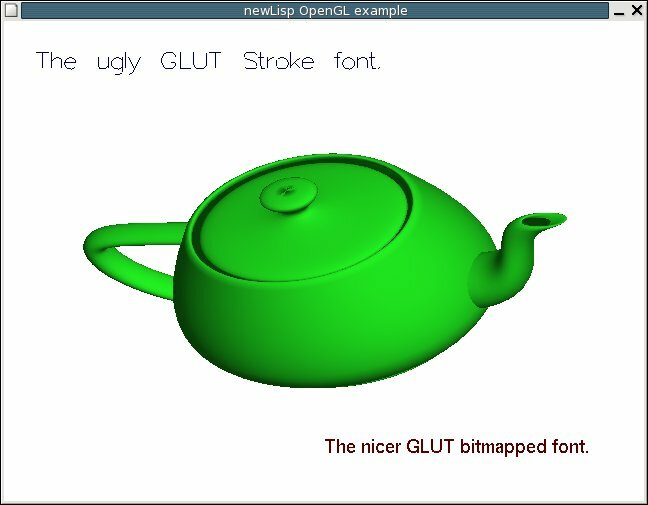 Here is an example how to import OpenGL libraries and draw 3d graphics, look at the Tea Pot and how its done in newLISP on macOS , Linux or 32-bit Windows: glut.lsp. See also this OpenGL demo. The file runs on Windows and macOS (Intel processors) using a Glut library and also demonstrates the usage of callbacks. For Windows a Glut library can be found here. On macOS the necessary libraries are standard on all systems, but the file runs on Intel like processors only. GL4newLISP distributes ready made freeGLUT libraries and newLISP import files for LINUX and Windows. FreeGLUT is a GPL replacement of the original GLUT library providing windows, mouse, keyboard and joy-stick I/O services for openGL. HPW's newLISP page, extension DLL's for the Windows version of newLISP.